See also dm Eiros/ typicals by demonics, dm Eiros/ unrecognisables by demonics. Info: Created on 9th August 2012 . Last edited on 12th August 2012. Some beauties here, but it remains a too much "intermediary" taste for me. I attach a sample of one of my favorite fonts of all times named "12 to the moon", it will show first, that i also have my masters, i don't come from nowhere, and second why i feel that, despite very good transformations here and there i find Eiros/aliens a bit too wise. 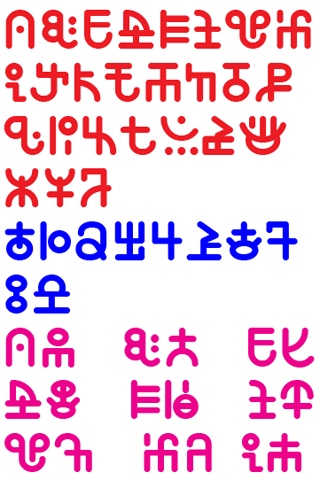 In the sample, A to Z are in red, 0 to 9 are in blue, and alternates for A to I are in pink. It seems we both have a reversed problem : i have difficulties to come back or stay true to original latin shapes, and you have difficulties to escape enough to impress a real "alien" feel despite the recognition of latin shapes. Another example with the extraordinary "Yokk-Mokk", another favorite of all times for me. @AFT // When I design fonts, I usually stick to the "boring" side of the type world; I occasionally venture into your territory. I started by making this aliens version, then decided I liked the letterforms so much that a regular monospaced version would have to be created as well, to please the large percentage of FontStructors who aren't as fond of crazy/alien styles. After that, I made the unrecognisables in honour of you, so I understand that while you may like the unrecognisables, the three fonts were meant to appeal to different senses of aesthetic. I will make the lowercase a bit more alienish when I have time, and the b on the unrecognisables was meant to be shaped like that, sorry. I think it adds a more subtly spiky effect. Congratulations! FontStruct Staff have deemed your FontStruction worthy of special mention. “dm Eiros/ aliens” is now a Top Pick. @meek // Thanks so much for TP No. 8! Great to see the process between the three fonts! Gah! I was working on something similar, but you made it so much better.